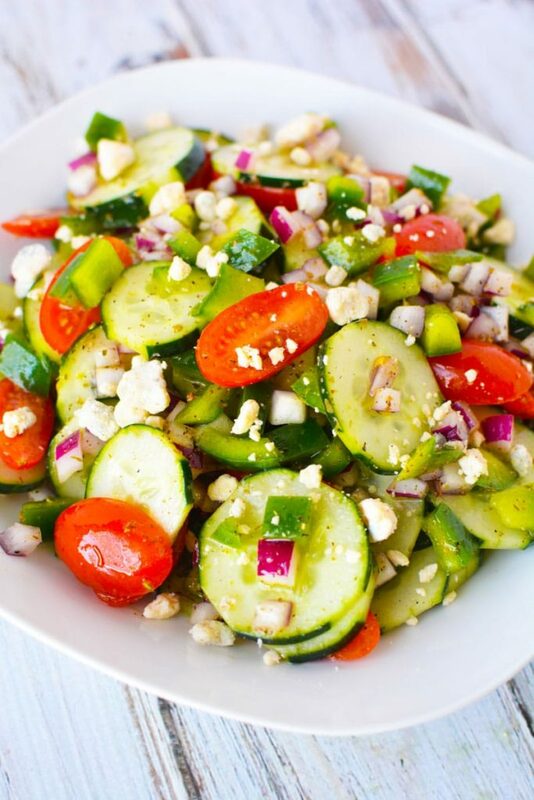 Cucumber Tomato Feta Salad is a fresh salad recipe packed with grape tomatoes and red onions. Dripping in a delicious olive oil, lemon, and red wine vinegar base, this is a healthy salad recipe that takes under 10 minutes to make, looks fancy, and tastes so light that you still have room for dips. Personally I love salads. I could probably eat a breakfast salad, lunch salad, dinner salad…OK, I may be pushing it on a breakfast salad, but in general, bits of veggies and protein are something I can feel guiltless about all day. And so many possibilities! From Italian Pasta Salad or cucumber tomato avocado salad, or sweet Ambrosia Salad, there is always a bit of deliciousness just ready to me baked, fried, mixed, or eaten. I would also be remiss not to mention a traditional caprese salad – OMG, tomatoes, mozzarella and basil? Yes, please! Plus, if you are having a party platter or group dinner, salad recipes are the easiest to make to feed a crowd. There are so many ways to enjoy cucumbers and with feta, blue cheese, or goat cheese is probably the best way. I just love how the cheese provides a little bit of melt into the veggies when you eat and I can flavor it with tang! Yum! In this recipe shown below, I used a blue cheese because that is what I had on hand, but feta works great as well with these flavors. I used a carrot peeler to peel away a bit of the cucumber skin to make it “fancy” for the summer salad. I also used grape tomatoes, but you can certainly use cherry tomatoes instead. Dietary Information: This Cucumber Tomato Feta Salad is LOW CARB and GLUTEN FREE. 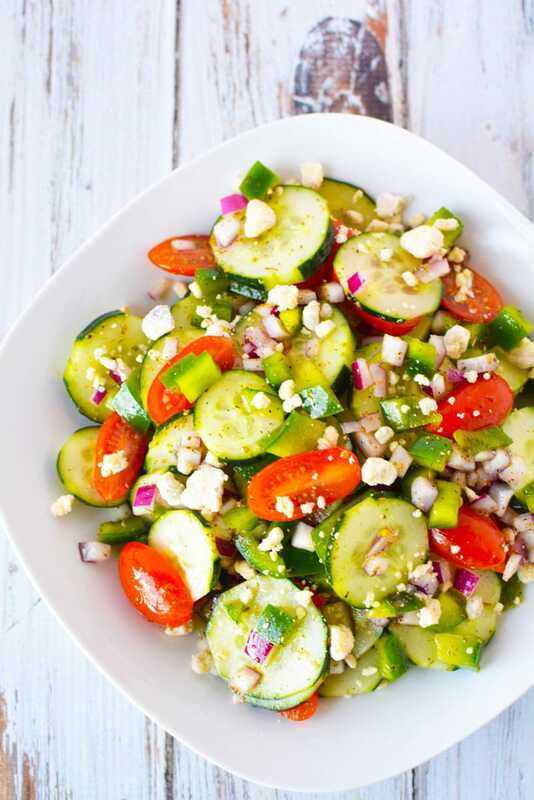 While this particular Cucumber Tomato Feta Salad is full of veggies, if you are looking for a sweet option, try adding some watermelon chunks in the mix! 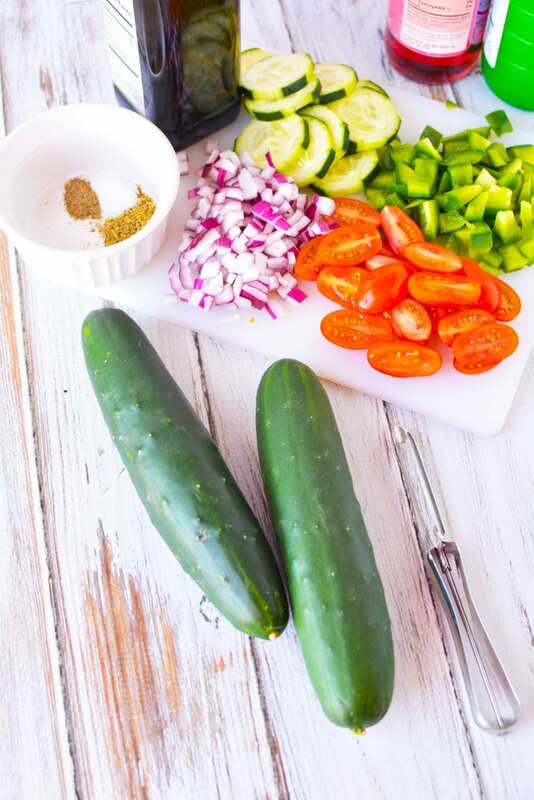 Slice the ends off the cucumbers and discard. 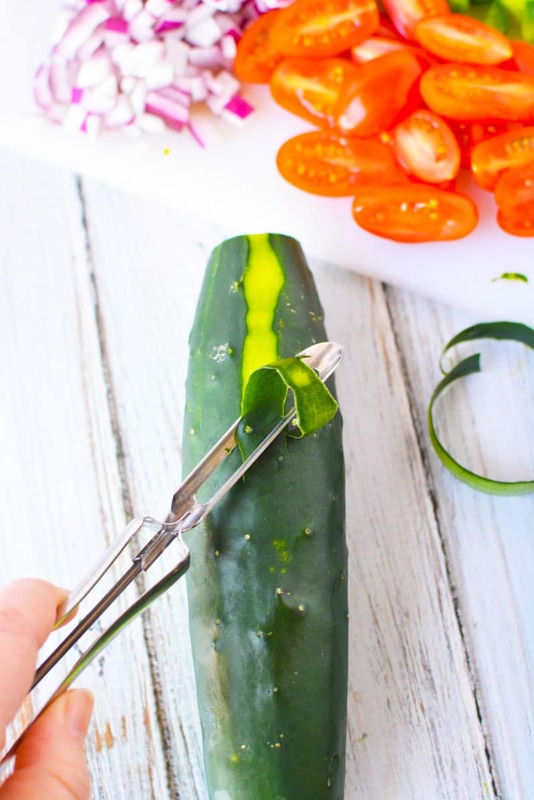 Use a carrot peeler or knife to remove a strip of skin all all the way around the cucumber. 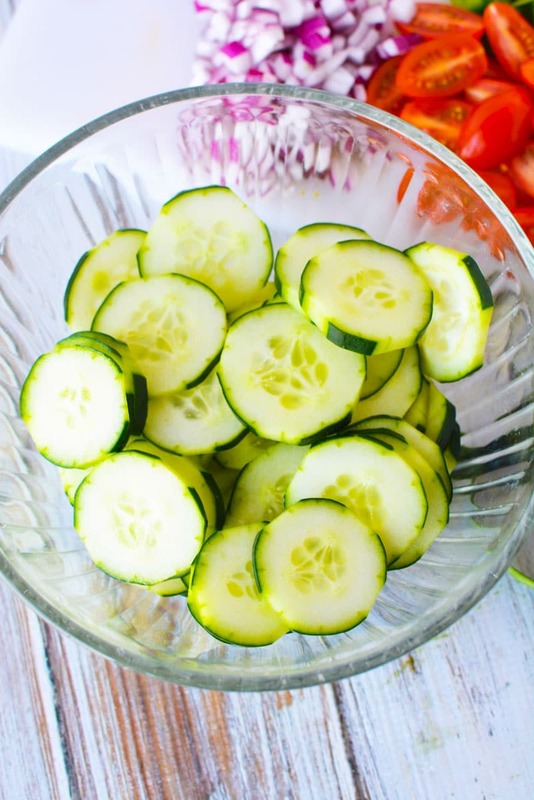 Slice cucumber into thin slices and put in a mixing bowl. Add tomatoes, red onion and green pepper to salad mixing bowl and mix well. 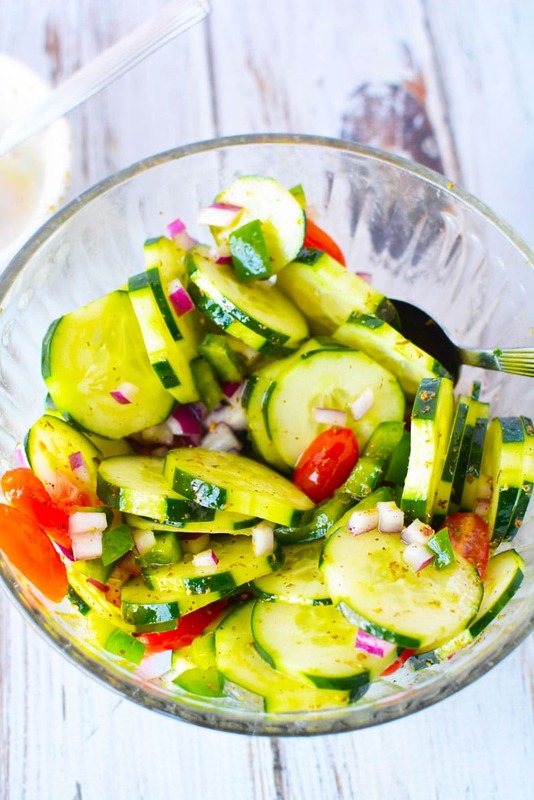 In a small mixing bowl add olive oil, vinegar, lemon juice and spices to make your dressing. Mix well, gently toss, and drizzle over Cucumber Tomato Feta Salad mixture. Refrigerate your Cucumber Tomato Feta Salad for at least an hour and stir well before serving and sprinkle with blue cheese (as shown) or feta. Cucumber Tomato Feta Salad fresh and healthy salad is packed with grape tomatoes and red onions. 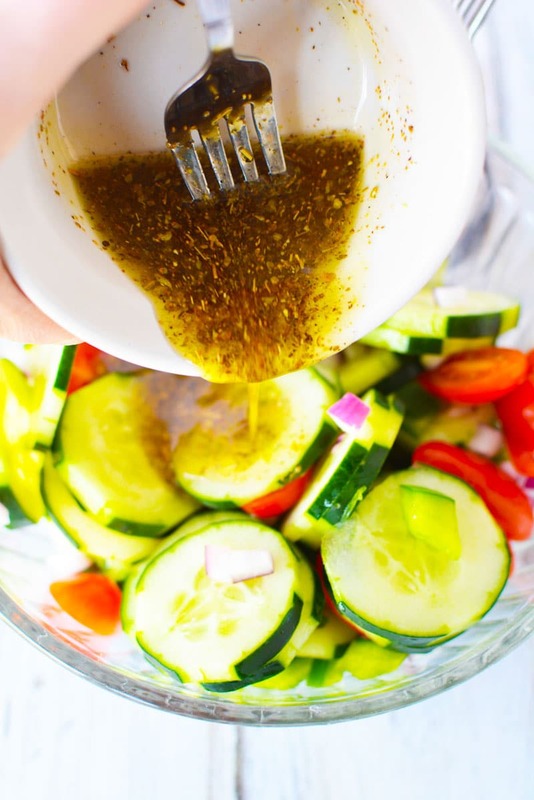 Dripping in a delicious olive oil, lemon, and red wine vinegar base, this is a healthy salad recipe that takes under 10 minutes to make, looks fancy, and tastes so light that you still have room for dips. Add tomatoes, red onion and green pepper to bowl and mix well. Mix well, gently toss, and drizzle over cucumber mixture. Refrigerate for at least an hour and stir well before serving and sprinkle with blue cheese (as shown) or feta. Never lose this recipe by pinning it or sharing it on Facebook!